Last Friday, whilst I was at The End of the Road Festival in Dorset, my short story (Baker, Emily and Me) which won the BBC Radio 4 Opening Lines competition was broadcast. 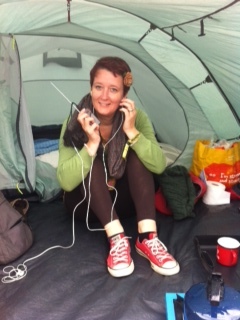 My lovely husband bought me a tiny portable radio just for the occasion, and at a quarter past three we went back to our tent to listen. That was of course a half hour early, so I heard quite a lot of what to do with your climbing hydrangeas on Gardeners’ Question Time before my story came on. So, here’s a picture of me listening, with the handy camping toilet roll beside me. Or you can both listen and watch the best band at the festival – St. Paul and The Broken Bones, here. Just don’t ask me about hydrangeas; I was too excited. I ‘listened again’ this morning and really enjoyed your story. I was interested in your recorded introduction where you put the age of the child younger than the actor reading. I imagined her to be a young teenager and felt the piece worked well. The girl having to trust in and learn from others was very apparent, and I was on the edge of my seat when she was struggling up the fence. I felt Baker could go either way and was happy with the choice he made, but sorry for the chicken obviously. The actor reading, Lizzy Watts, is about 24, so quite a bit older than the narrator, even if she were a teenager. The producer did consider hiring a child actor, but apparently then decided that it would make it too difficult, so in the end chose someone with a very young voice. Of course, I’m very happy for listeners / readers to imagine that the narrator is a teenager. It’s just in my head she’s about eight mostly because of the language she uses. And I’m really happy that you weren’t sure which way Baker would go when he was the fence – I tried to add some tension into that, so you wouldn’t be completely sure. And as one of my friends texted just after it was broadcast – poor Emily. Thank you so much for taking the time to listen to it, and writing me a comment. I missed the intro when I listened, and happily imagined a child between eight and ten from the style of her language. I had a childhood with chickens and such and kept wanting to tell Emily – child-to-child – that if you get close to a chicken and stand over it, it just crouches and you can pick it up easy!